The Casual Loom Knitter: What is this? I had two problems with this knit. The fact that it wasn't worsted made it a pain if I had to reverse my knitting when I made my mistake. When I did the gathering cast off, pulling the yarn through the loops was a delicate process. Pull too hard, or have the working yarn touch the loop edges too much made the yarn break because of too much tension. 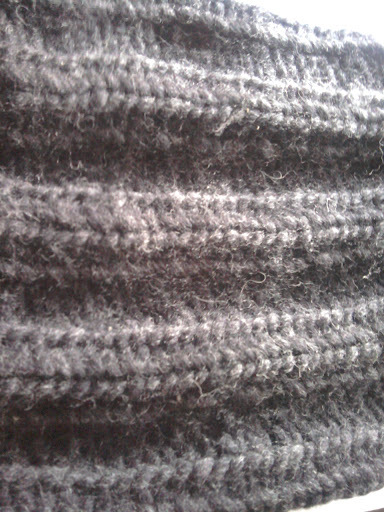 I also prefer super bulky for hats just because my knit stitches are close together and form a v shape. With bulky there is a little space in between. I know if I really wanted a v shadow I would used the twisted stockinette (e-wrap) stitch but it is so messy looking. A majority of people have rib knit stitch hats in the wintertime, and most of the time they are made with acrylic yarn. It's a great simple pattern to knit and gives some stretch. It also doesn't take that long but you have to be used too knitting peg by peg.